If Social Media Hashtags give you a headache because you don’t know whether you should be using them on a specific platform or how many to use or which ones to use, then keep reading for some instant hashtag pain relief. You will discover how to use social media hashtags like a pro by the time you finish reading this post. Let’s start at the beginning with an overview of hashtags, what they are and how they work. Then we’ll move into breaking down each platform and how you can use hashtags for big results. And we’ve created a handy quick guide infographic below – that you can save and refer to anytime! What are Social Media Hashtags? Hashtags are any words or phrase with a # symbol in front of it. Hashtags were first used on Twitter by the community as a way of grouping conversations about the same topic together way back in 2007. They added a hash or a pound symbol in front of a word. In 2009, hashtags were formally adopted by Twitter, and anything starting with # became a hyperlink. This meant hashtags became searchable. Since then hashtags have been adopted universally across social media and by the media. It’s hard to imagine life before hashtags! How are social media hashtags used? Add emotion through showing opinions or having fun. Sound like a lot? It is, but the beauty of hashtags is that they are simple and easy to use. 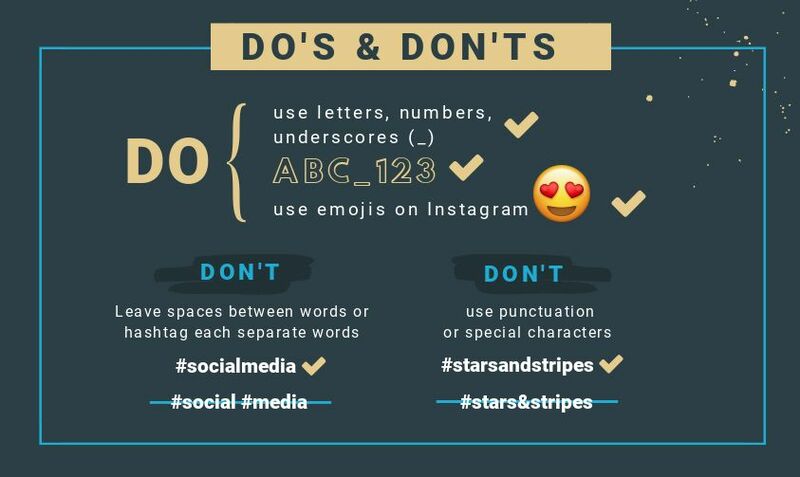 Here are a few “DOs and DON’Ts” to help you navigate the best way to use Hashtags. Spaces – Don’t leave spaces between words or “hashtag” each separate word. For example, don’t use #social media or #social #media when you mean the concept #socialmedia. This is a rookie error. Punctuation and other special characters DON’T work in hashtags. Special characters like, commas and exclamation marks are counted as a space and will break up the hashtag. For example, if you wanted to use #stars&stripes as a hashtag, the ampersand (&) would be counted as a space. This means that only the word #stars would be hashtagged. Use #starsandstripes or #StarsNStripes or #stars_stripes instead. Capitals – It doesn’t make a difference whether you use a capital or not in your hashtag. It is useful to add capitals to the beginning of each word in the hashtag on Twitter, however. Tweets move at a fast pace and it makes the string of letters easier to read. Ownership – Anyone can create a hashtag and use it, and that includes you. Social media hashtags belong to the community, even if you create a unique hashtag. The way it gets used may be different from what you expect. Keep on reading to find out how to avoid pitfalls (and not mess it up). Different social media platforms use hashtags slightly differently and you don’t want to get it wrong. Let’s start with our super handy infographic that you can save to Pinterest, bookmark or add to your desktop for reference. It’s the “Quick Reference Guide” to this post. Then scroll down for a full break down of all the social media platforms in detail. Please include attribution to about.easil.com with this graphic and link to this post. Social media hashtags were invented on Twitter, so of course you should use relevant hashtags to increase engagement on Twitter. Engagement includes clicks, retweets, likes and replies. Hashtags on Twitter will also be found in Google searches. 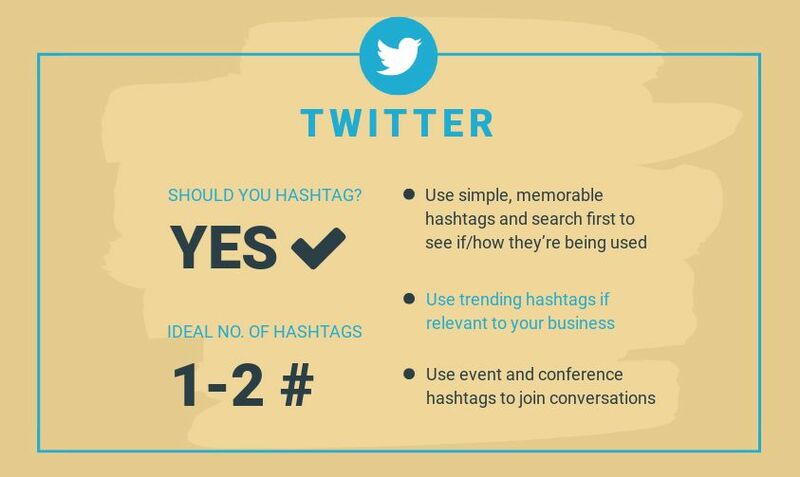 If you’re on Twitter, you need to be using hashtags! Use between one to two hashtags. Research consistently shows that using one hashtag improves your engagement significantly versus not using any. However, don’t be tempted to use more than two hashtags. Engagement drops when more than two hashtags are used in the same tweet. Always, check whether hashtags are being used before you start marketing a hashtag. A social media expert (who really should have known better), started a Twitter chat using a certain hashtag. He had to abort the hashtag rather rapidly and remarket another hashtag when he discovered during his first chat that the hashtag was popular with the adult entertainment community. Yikes! Keep it simple and memorable. Most people will not remember acronyms or weird spellings. Longer hashtags are likely to be misspelt. It should be obvious what the hashtag is about. Make it easy for your customers to use the hashtag. Check that your hashtag can’t be misread. Susan Boyle’s PR team infamously promoted her album release with the hashtag #susanalbumparty. Yes, that’s meant to be “Susan Album Party”, but you can see why it became very awkward very quickly. Yikes! Promote your hashtag. Make sure it is obvious on your website. Mention it in your emails and create a Twitter header and images displaying the hashtag and include it in your Twitter bio. Do you want to be found by people in your industry or do you want to be found by customers? Look out for the hashtags that customers are using and sharing – and do your own research by typing potential hashtags in Twitter’s search bar. Use tools to find hashtags, but don’t be tempted to use more than two hashtags per tweet. Two highly-recommend tools for you to try are Ritetag and Hashtagify. Don’t jump onto a hashtag just because it is trending. Make sure it is relevant for your business, and that your tweet relates to the hashtag. A useful visual tool that is great to help you find trends is Trendsmap. Plan for recurring trends like popular holidays and hashtags used for days of the week like #WellnessWednesday. Tweets with images get substantially more visibility and engagement than those without. Add a popular hashtag together with an image and you’re onto a winner. 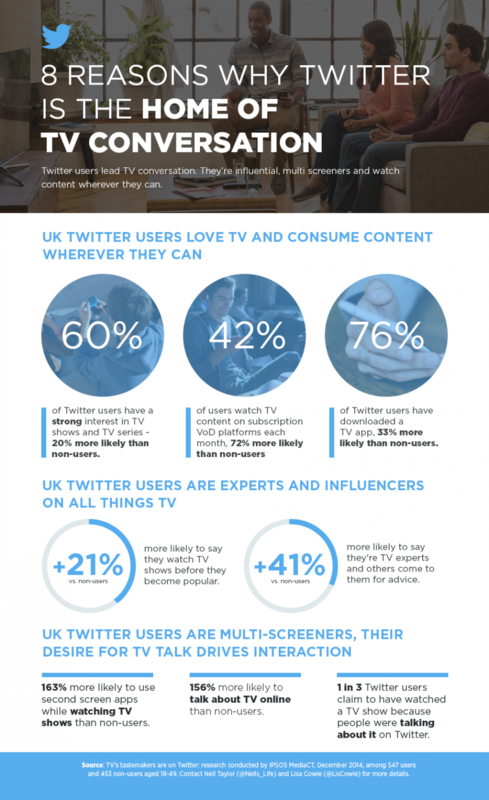 Twitter users love having a conversation about their favourite television show. Join the conversation while it is happening if it relates to your business. Twitter chats are scheduled for an hour at a set time to discuss a set topic with a hashtag. Joining a relevant Twitter chat for your business niche will put you directly in touch with potential customers. Most events such as tradeshows, exhibitions and conferences have a social media hashtag associated with them. Spend time connecting with people using the hashtag, before, during and after the event. Love them or hate them, having a hashtag strategy is essential for Instagram. In fact, hashtags are key to being discovered on Instagram. If you’re a big brand or a celebrity with millions of followers, you could probably get away without using them, but for the rest of us mere mortals, hashtags are our life blood to being found on Instagram. 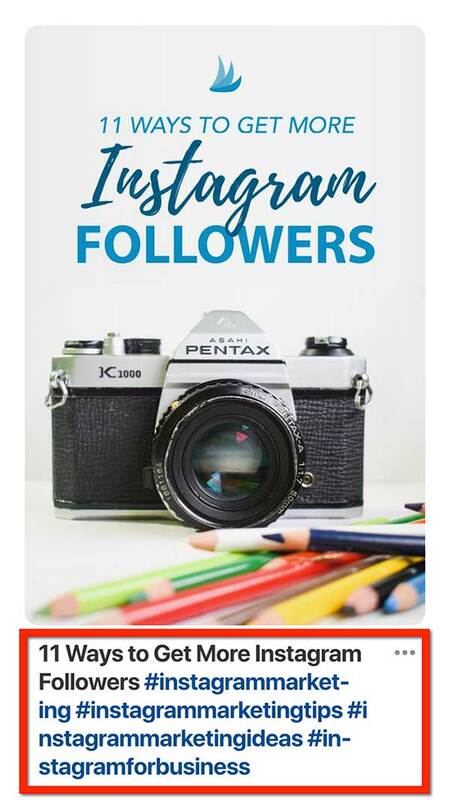 Instagram has over one billion active users each month. That’s a lot of photos and videos being shared each month! The only way to search on Instagram is by user, location or hashtag. Adding targeted hashtags to your posts will grow your followers and increase engagement on your post. Posts with at least one hashtag average 12.6% more engagement. (Simply Measured Q3 2014) and as high as 70% according to Agorapulse. You can use up to 30 hashtags per post. Agorapulse checked this out via their Social Media Lab and found that yes, using the maximum of 30 hashtags brings in more likes (between 40-135% more likes in fact). The time you add your post is the time that hashtags will be counted from even if you add hashtags later. So, make sure you add your best hashtags at the same that you post.You can add hashtags to both the caption and the comments and both will count for your post. Agorapulse suggest from their research that it’s actually better to post your 30 hashtags in the original post which returned more likes and comments. Hashtags that other people add to your comments do not work for your post. If you have a business account, use post insights to see how many people discovered your content through hashtags. You can now follow hashtags easily which means any posts using that hashtag will show up in your feed whether you follow the person’s account or not. You can now add clickable hashtags into your bio. This is great news if you have created a hashtag for your business. You can now add hashtags into Instagram Stories. Instagram stories have three times more active users than Snapchat. 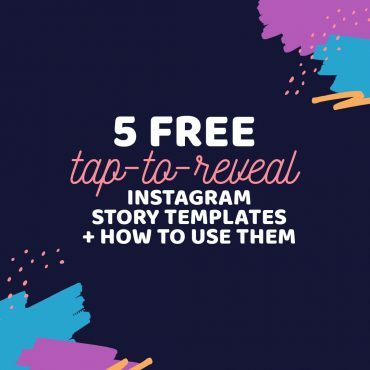 It’s a brilliant way to get your stories found by a bigger audience. You can easily add the hashtag via stickers on your story. 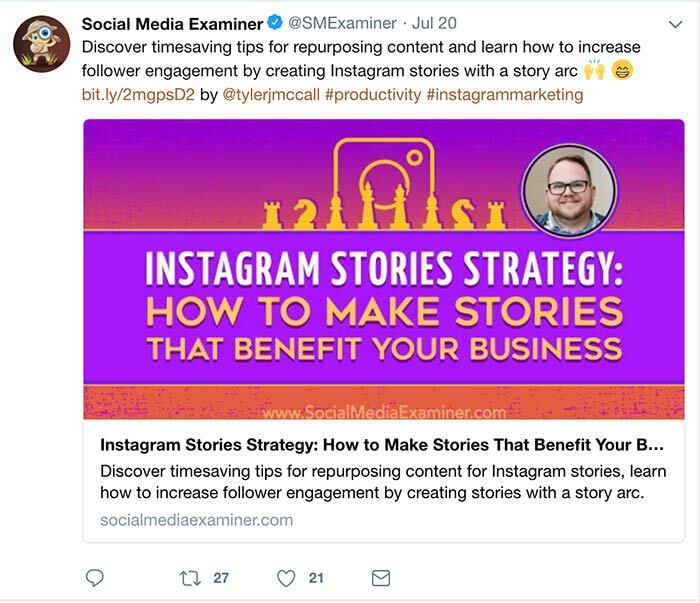 Stop your post looking spammy by either creating a break between the caption and the hashtag, or adding most of your hashtags into your comment. It’s not necessarily the number of hashtags that you use that will help you get found, it’s the quality of the hashtags that you choose to use. Use tools like Hashtagify and Ritetag to find great hashtags. Ritetag will suggest hashtags based on the image you use. Use the Explore function to find popular hashtags and related hashtags. If you use a tool like Planoly, you can type in hashtags as you write your caption and it will show the number of shares per hashtag. You can also save hashtag hubs to use again later on similar posts. 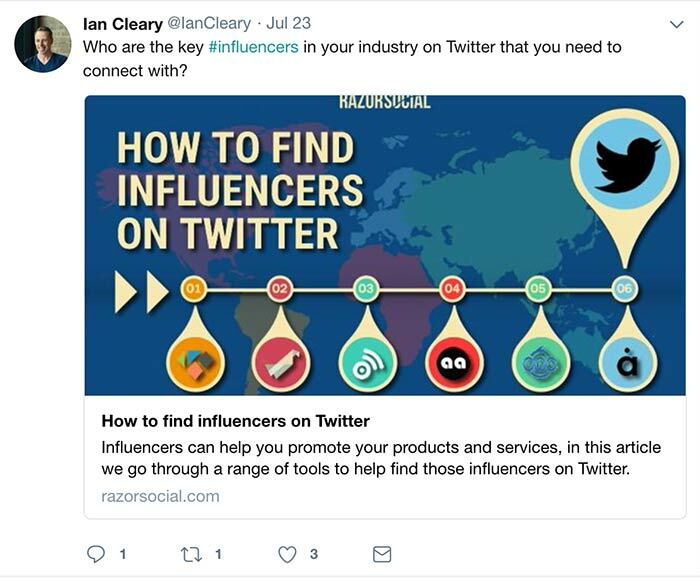 Watch influencers and people in your industry to see which hashtags they use. Remember to be customer orientated with your hashtags. For example, if you were a writer the hashtag #amwriting will be used by other writers, but #amreading will be used by readers. Highly popular hashtags are a waste of time, unless you are a big brand or a celebrity because the feed moves so rapidly. Find your own sweet spot for which hashtags help you get found. 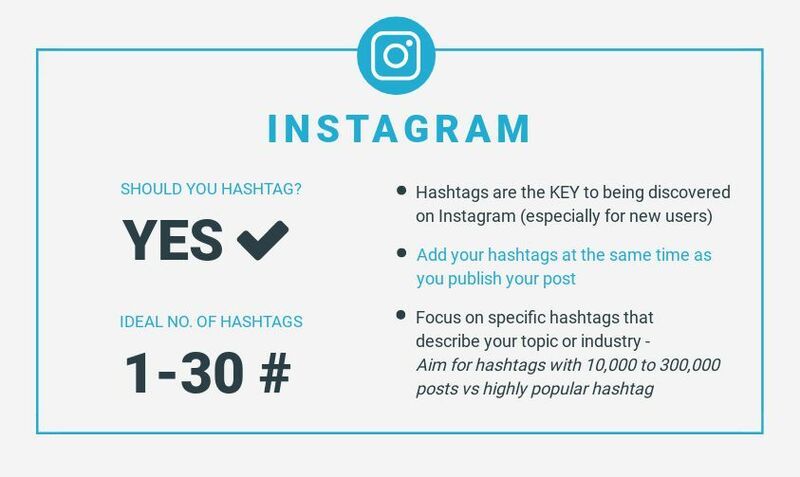 You might find hashtags with 10,000 to 300,000 posts work better for your account. Choose hashtags that describe your business or industry, that are relevant to your caption and your image. 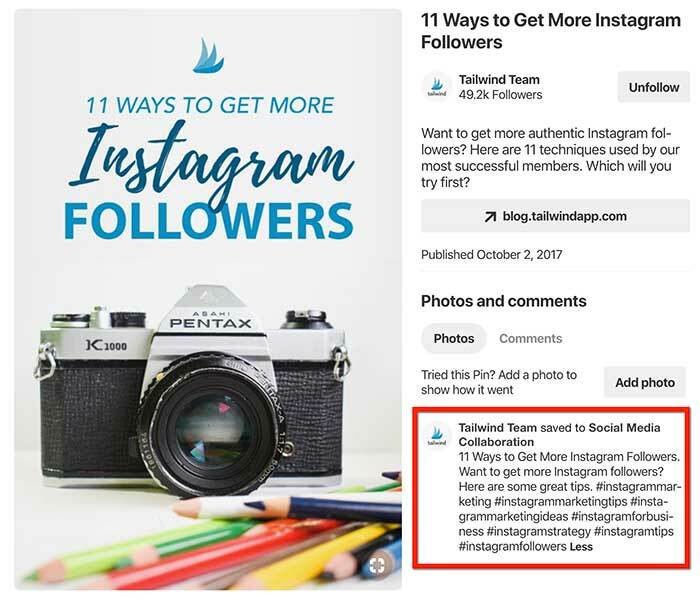 This post by Iconosquare is a great overview of the types of hashtags that work best on Instagram including tips for researching industry-specific hashtags. Add hashtags that may be timely (around events or celebrations) or add feeling or emotion. Don’t forget to add your location hashtags to help you get found by local people. Facebook introduced clickable hashtags in 2013, but Facebook users have never warmed to them, so use them with caution. There is no harm in using a hashtag on Facebook especially if it is about a trending topic or event. Hashtags help people to find topics that they are interested in, so you can increase your visibility by adding a relevant hashtag. You can also create a conversation around a hashtag because hashtags have a unique URL and people can see all the discussions based on a theme. Research by Social Bakers and TrackMaven discovered that Facebook posts that use just one hashtag performed best and there is a decrease in engagement when more are used. TrackMaven saw engagement dive when more than six hashtags were used. Using too many hashtags can lead to a decrease in engagement. This is important to remember if you automatically share from other platforms like Instagram. Your post will appear on Facebook looking very hashtag-heavy. Facebook Privacy settings affect hashtags. Business Pages are automatically public, so the hashtags will be visible, but the visibility of hashtags used in Groups and on Personal Profiles will be restricted by the Group and individual’s privacy settings. Hashtags can be used in groups to help the administrator organise conversations within the group for example #collabthread (for collaborators) or #help. Test to see what impact hashtags have on your Page posts by looking at your Facebook Analytics. In summary, if you want to use hashtags on Facebook, go ahead, but restrict how many hashtags you use and make sure that they are relevant. In case you haven’t heard: Pinterest has adopted clickable hashtags in pin’s descriptions. If you aren’t using hashtags on Pinterest, it’s time to start. Hashtags in descriptions can be found in search on Pinterest. There are over two billion monthly searches on this platform. Pins with hashtags get better distribution, especially on the first day they’re saved to Pinterest. They help your NEW content get found faster. Hashtags currently don’t work in the same way for Repins or Promoted Pins. 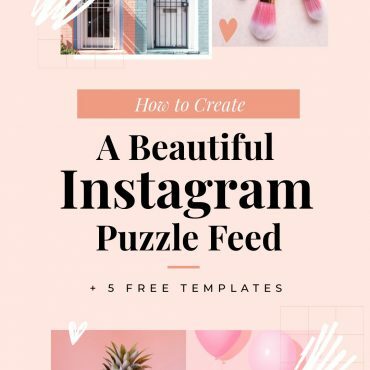 Pinterest have said that when you search for a hashtag, the freshest pins will be at the top of the feed because Pinterest favours fresh content pinned from websites. This means that it is important to add hashtags while you pin. There is little point in going back to old pins to add hashtags because they are unlikely to show up in search results. 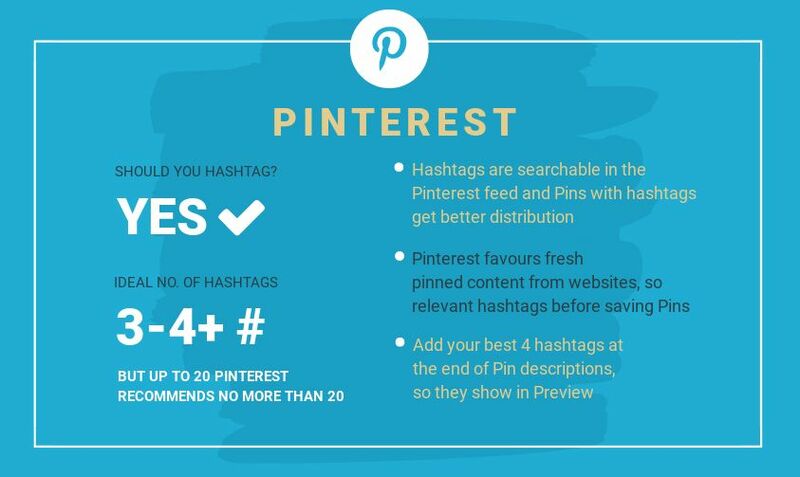 Pinterest recommend using no more than twenty hashtags. Pinterest will show you related hashtags and how popular hashtags are when you add your pin’s description. Pins with the same hashtag are linked together so when someone clicks on a hashtag, all pins using that hashtag will be shown in their feed. Add your hashtags at the end of the description so that your readers get the best experience. The first 4 hashtags will be seen in the preview. What does this mean? Make sure that you use at least four of your best social media hashtags at the start of your description for new pins. This helps people to know more about your pin at a glance. Use a keyword planner tool to find your important keywords and include those in your pin description along with specific descriptions. Do some research on Pinterest to find related hashtags and themes used by other pinners in your industry. When you type “#” and start typing your potential hashtag, Pinterest will show you related hashtags and their popularity in a dropdown list. Use this to find hashtags! Make sure that all the hashtags you add are relevant to a pin. Include broad categories and associated topics as well as hashtags that describe your pin. 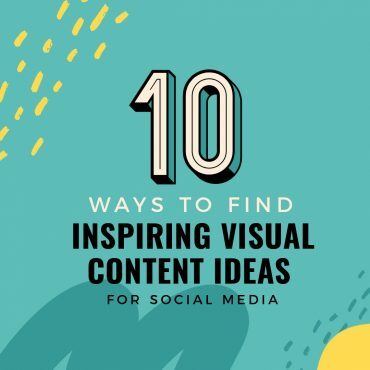 Think in terms of what your ideal customer might be searching for on Pinterest. Don’t forget to add your location as a hashtag if you are a local business. It will help your customers to find you. Use at least four hashtags for each pin, but don’t go overboard with hashtags. Hashtags are still new to Pinterest. Stick within their recommendation of a maximum of twenty hashtags and experiment to see what works for your account. LinkedIn has played with hashtags in the past and now has reintroduced them. Hashtags on LinkedIn Published Articles seem to be established. Clickable hashtags on posts are new. According to LinkedIn hashtags on post are still part of an experiment which is not available to all members. However many users are seeing hashtags in status updates so it appears to be something that will be staying on LinkedIn. Watch this space! A maximum of 2-3 hashtags per posts is plenty. Monitor what other users are doing over time, but don’t overdo it. Use hashtags to tag your LinkedIn Published Articles so that they can be found. You need to add tags at the same as writing the draft. You can’t add or change your hashtags once it’s published. 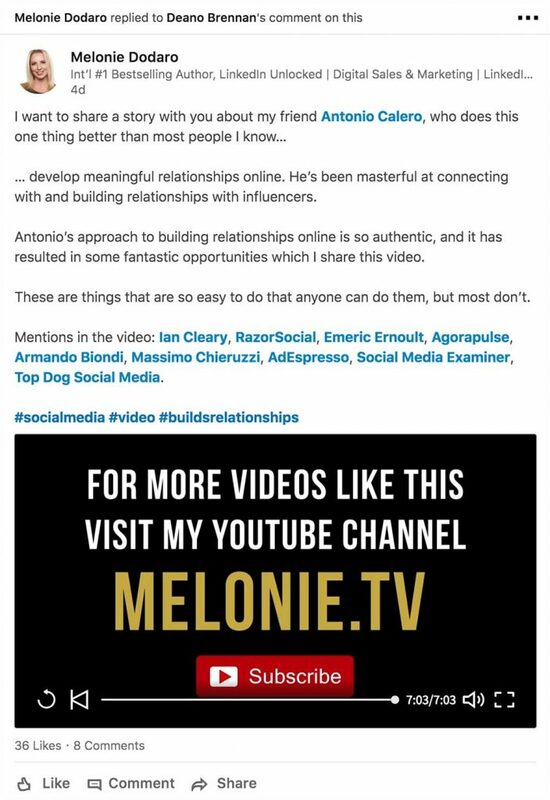 Hashtags on LinkedIn Published Articles don’t appear within the article. They are found in the commentary that appears above your article in the LinkedIn feed. LinkedIn is encouraging people to join discussions on topics. They have added the feature so that you can follow interesting hashtags. If you type any hashtag into the search bar, LinkedIn will return a list of posts, groups and companies that match that hashtag. 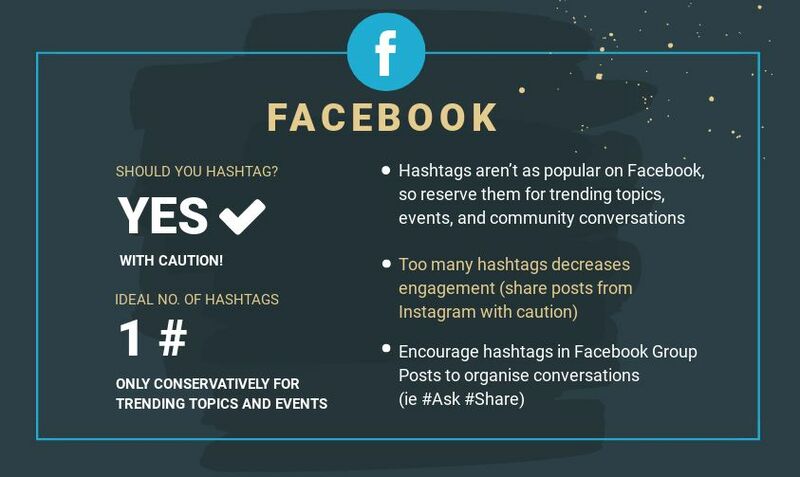 Start adding hashtags into your status updates but do so with caution. The LinkedIn community is still getting used to hashtags so don’t go crazy. When you write a post on LinkedIn, a list of suggested hashtags will pop up. Use all the hashtags that are relevant to that post. You will be at a disadvantage if you only use a third-party app and don’t add hashtags to your post. It is worth using hashtags so that your posts can be found by people who are not first connections. When using hashtags on LinkedIn use them primarily as keywords for your business. 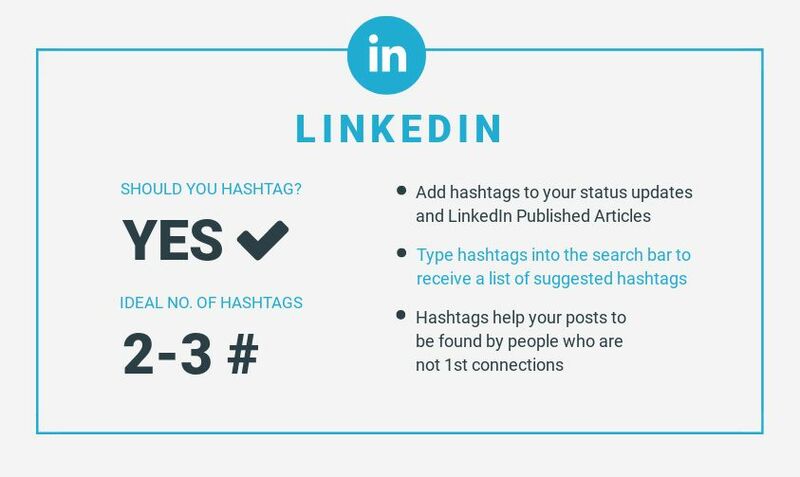 Start typing and LinkedIn suggests hashtags based on keywords. 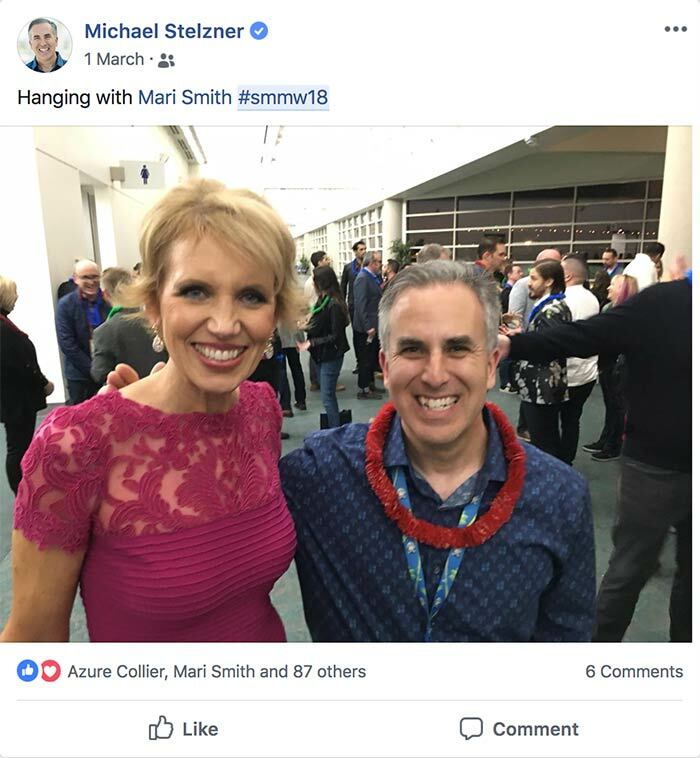 LinkedIn is all about business networking, building your professional brand and connecting with the right people. LinkedIn is saying that hashtags are an important way to be discovered, so you would be a fool not to start adding them to your posts now. Now you should be confident to use the best social media hashtags on every platform. They are there to help you get found and to find other accounts and discussions. Use them to help your business and remember that hashtags are fun! What platforms are you using hashtags on and where are you finding the most success with them?